Margaret Leahy (1902–1967) was a British actress. After winning a beauty contest, Leahy went on to make only one film in her very short-lived film career. British postcard by Rotary Photo, London, no. 5.76. 3. Caption: "The Daily Sketch girl. Adopted by Miss Norma Talmadge." Margaret Leahy was born in London, Great Britain, in 1902. At 18 years of age, she set up a costume shop in Brixton, England designing women's clothing and modelling her designs for interested buyers. In 1922, a starring role in a major Hollywood film was offered by the Daily Sketch newspaper in a grand and widely publicised film star competition. The genesis of the idea came from the American company First National Pictures, with their two leading stars, Norma and Constance Talmadge. Joe Schenck, chairman of First National and Norma Talmadge's husband, probably proposed the idea, but at the encouragement of Sir Edward Hulton, the owner of the popular newspapers the Daily Sketch and the Evening Standard. The competition was to find a British actress to play second lead in Norma Talmadge's forthcoming film Within The Law. Norma and Constance Talmadge themselves would come to Stoll Film Studios (where the screen tests were to be made) and select the winner. The contestants reputably numbered nearly 80,000 and the competition resulted in three girls thought suitable: Katherine Campbell, the French Agnès Souret and Leahy. 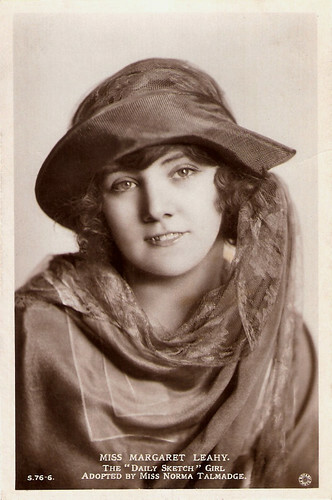 Norma Talmadge stated that Leahy was "the most ravishing girl in England" and had "a perfect film face ... splendid eyes, a supple body, and convincing expressions ... her features are so perfect, and her character so distinctive!" Prior to depart to Hollywood, Leahy toured several major cities in Europe and was greeted with hundreds of cheering fans and photographers as the new film star that was about to be born. In November of 1922, Margaret Leahy sailed on the 'Aquitania' for America. She arrived in New York on 3 December and was greeted by a huge crowd which included Norma and Constance Talmadge, director D.W. Griffith, Mae Murray and Marion Davies. After a short stay in New York, Leahy boarded the train for Hollywood with the Talmadges. When she arrived in Hollywood she was met by Charlie Chaplin and Mary Pickford. Everyone in Britain was anxious to know how she got on. Postcards of her were put on sale, and the Daily Sketch commissioned her to dictate a diary of her experiences. She began working with director Frank Lloyd who was going to make her a 'star.' Although it was said by her publicity that the young beauty queen had acted in English and French films in Europe, this proved to be highly untrue. Lloyd had her dismissed from Within the Law (1923). The silent film was supposed to be Leahy's big film debut, but director Lloyd claimed that the actress could do nothing that an actress was supposed to be able to do. The part of Aggie Lynch in Within The Law went to American actress Eileen Percy. British postcard by Rotary Photo, London, no. 5.76. 6. Caption: "The Daily Sketch girl. Adopted by Miss Norma Talmadge." 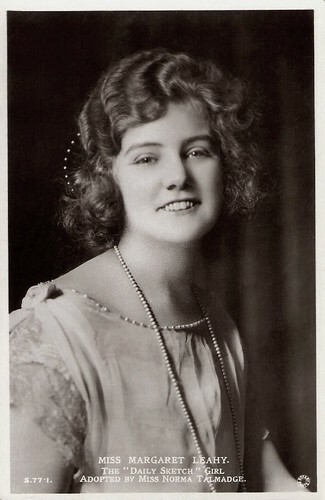 In 1923, Margaret Leahy was selected as one of thirteen WAMPAS Baby Stars. The WAMPAS Baby Stars was a promotional campaign sponsored by the United States Western Association of Motion Picture Advertisers, which honoured 13 young actresses each year whom they believed to be on the threshold of movie stardom. The campaign ran from 1922 to 1934. Leahy was probably selected due to the help of producer Joseph Schenck, who had signed a three-year contract with the girl. Following this, Schenck believed it did not take much for an actress to be a comedian, and handed Margaret over to his brother-in-law Buster Keaton to appear in his next comedy, the silent feature Three Ages (Edward F. Cline, Buster Keaton, 1923). Film historian Luke Mc Kernan writes about the film at BusterKeaton.com: "A comic history of love in prehistoric, Roman and modern times, it has Keaton fighting his rival, Wallace Beery, over a girl [Leahy] and winning her against the odds each time. Allegedly parodying Intolerance, it is really three sketches strung together rather than a true feature, but it is still highly amusing (especially in the Stone Age sequence) and boasts some breathtaking stunts." Leahy's only film did absolutely nothing to improve her already crumbling film career. After the film finished shooting, there were no attempts to put her in any other films as she was labelled as being untalented and incapable of learning how to act. In the press, Leahy's role was not given much attention, and she never acted again. She went so far as to sue Joseph Schenck for $50,000 for breach of contract and injured feelings. Leahy chose to remain in California and get married, instead of returning to England. 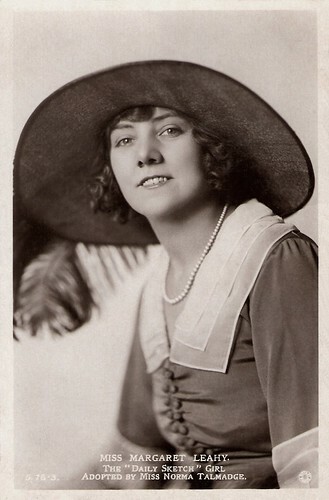 She later became an interior decorator for Bullock's department store, going by the name of Marion Meade. She grew to despise the movie industry and burnt all her scrapbooks. In 1967, Margaret Leahy apparently committed suicide in Los Angeles, California, at the age of 64. British postcard by Rotary Photo, London, no. 5.77. 1. Caption: "The Daily Sketch girl. Adopted by Miss Norma Talmadge." Sources: Luke McKernan (Buster Keaton.com), Wikipedia and IMDb.